I just have to warn you guys that this hairdo might look a little intimidating at first but don’t let it scare you! 🙂 It really is so much more simpler than you would think and it is such a fun up do. This is a multi-step hairdo but when you see the finished project you will just die! 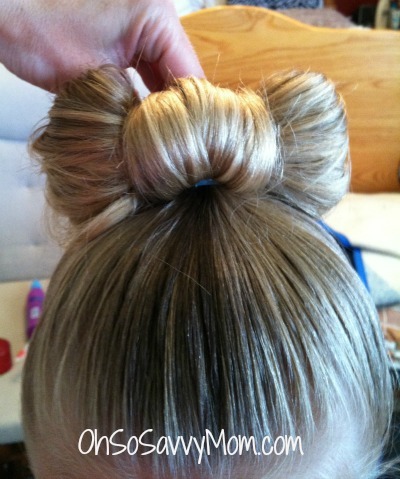 It is so adorable and everyone who see’s it will want to know how you did it! And it is perfect for the holidays, too! This can be done with any length of hair. 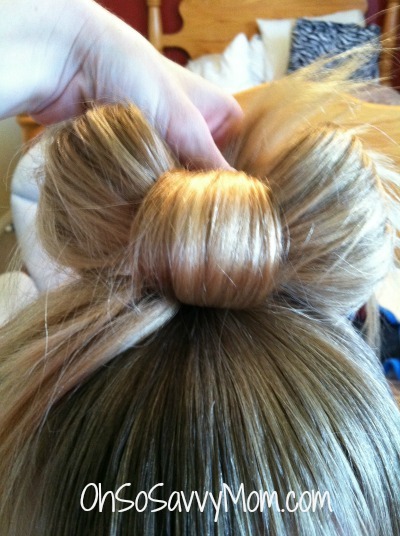 If you have shorter hair you will just have a smaller bow. My daughters hair is pretty long so it makes a big bow. To start, just brush out the hair tell it is smooth. Then pull it up into a high ponytail. The higher the better because you want it to sit on top of their head. When you secure the ponytail with an elastic, only pull it half way through the last time you pull the hair. Creating a loop on the back and the ends of the hair hanging down the front. Now just split the ponytail down the middle into two sides. This is going to be your bow. Also split the ends that are hanging down into two. Now we are going to work on one side at a time. 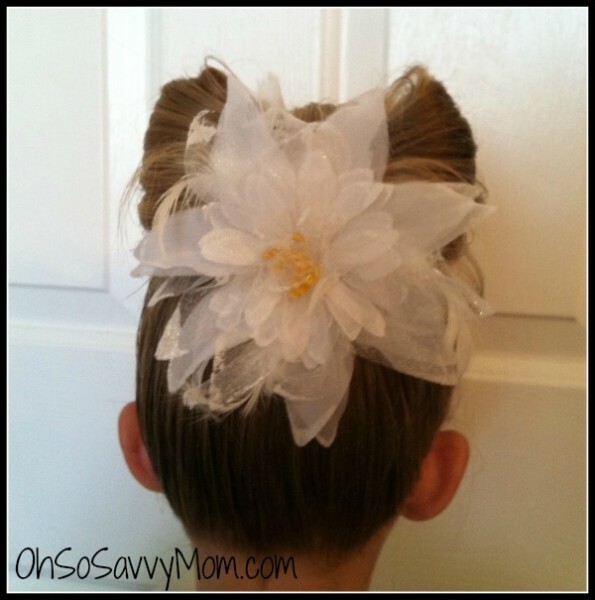 (I did my right side) Grab the hair that is hanging down in the front and we are going to put it between the two loops and take it to the back. 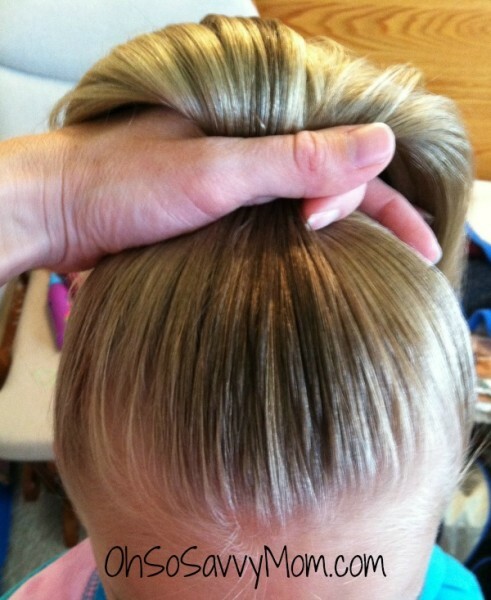 Once you have the hair pulled back we are going to secure it with bobby pins. Use as many as you need to get it to stay. 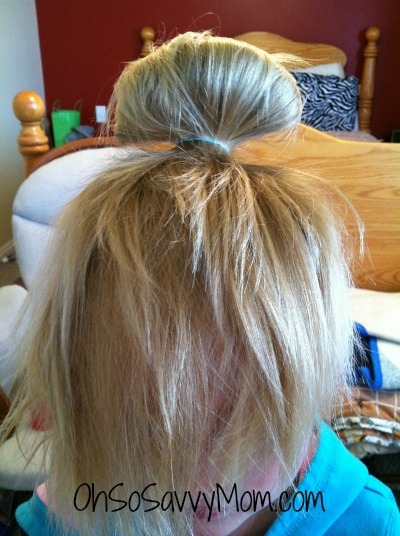 Then you take the hair that is hanging down and stuff it up into one side of the bow. 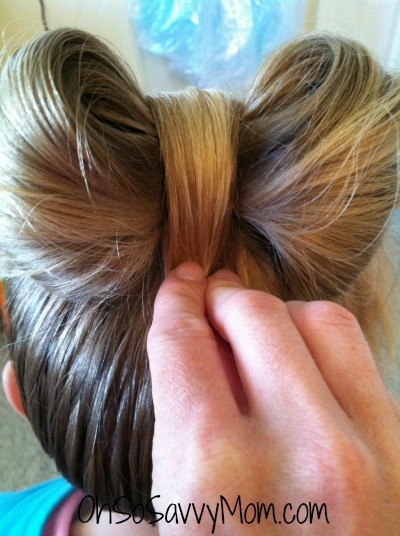 This will hide your ends if you have longer hair and it will also make your bow big and fluffy! Now we just get to repeat it on the other side! Grab the hair hanging down on the left side. 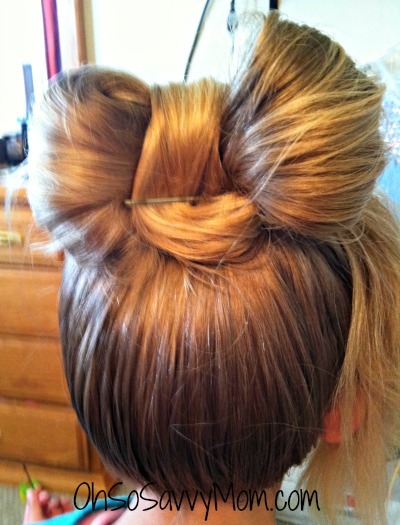 Bring it in between your bow and secure it in the back with bobby pins. Then stuff the ends up inside the other side of the bow. Now your bun is all done! Depending on how much hair you have and how many bobby pins you used it might look a little messy in the back. 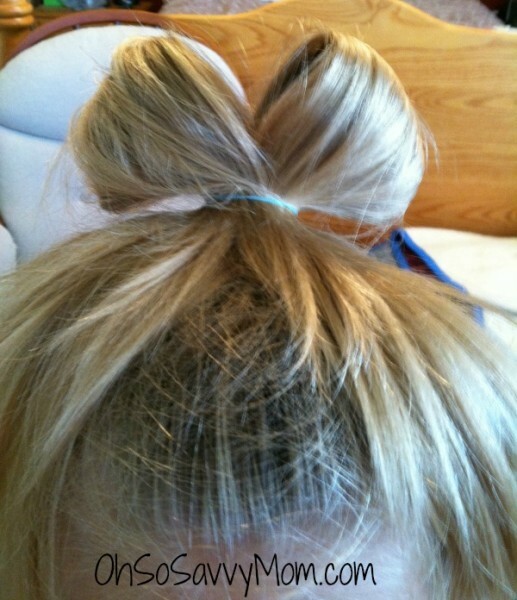 So just add a cute flower below the bow in the back to accessorize! Voila! So cute and fun! Previous PostHave a little photographer? VTech Kidizoom Camera Review and Giveaway! Thank you so much for sharing this tutorial! I am going to try this!! This is too cute! I have see this many of times and wondered how it's done, and now I know. thanks for sharing this. This is too cute for words. If I tried it, it would look like a hot mess. WOW this doesn't look that hard at all. Would be very cute for a daddy daughter dance or if your little girl is having a birthday party. I can picture this on my little girl in her dress up tutu and sparkly wear. Very cute style. Very cute!! I was surprised how they came together but now I see it!! thanks for sharing. 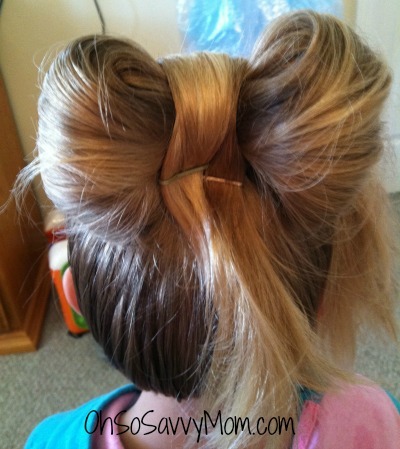 This is a cute hairdo that I am going to do to my niece when she comes over. This is a nice hairdo for the Summer and it looks easy to do. Thanks for the tutorial. 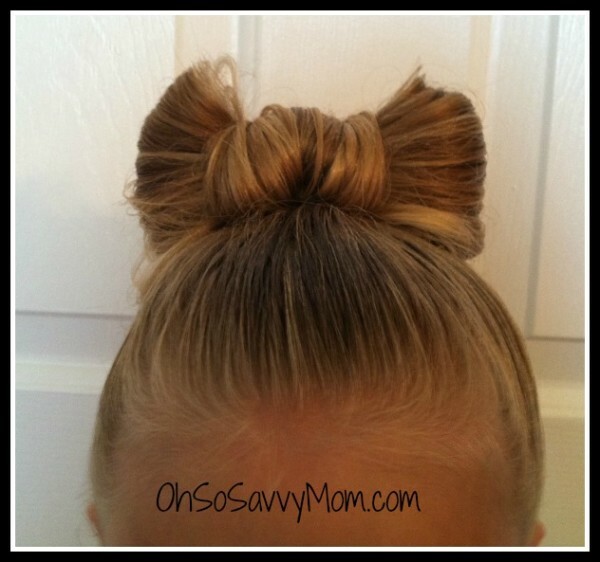 Wow - I've never seen a bow-bun before. And it isn't that hard to do, and the flower puts it over the top! So cute! Oh my goodness this is the cutest hair style!! This would have looked adorable on my daughters when they were younger! I wonder if it would look ok with curly hair? My middle girl has long curly hair and this is just to adorable not to try! That is a skill to get the hair to do that. I think it would end up looking like she put her finger in a light socket if I attempted that.